Bindass, in a first-of-its-kind association, collaborates with popular fashion designer Nishka Lulla for its successful series – Girl in the City-Chapter 2. Known for her distinctive chic boho style that reflects the free spirit of modern day Indian woman, Nishka Lulla comes on board for a unique ‘Girl in the City’ initiative that celebrates 10 real-life women entrepreneurs with stories similar to its protagonist Meera Sehgal’s. An online contest going live on bindass’ social media platforms on 28th April, 2017 provides an opportunity for women entrepreneurs from across the country (all India) to share their personal journeys in pursuit of their dreams and passions, much like the series’ protagonist Meera Sehgal. Over a period of one month, ten winners would be selected. The talented Nishka Lulla will spend quality time interacting and mingling with the winners in order to profile them and design distinctive looks. Each of which will encapsulate the unique stories and personalities of the winners. “I am thrilled to associate with brand bindass for this extremely innovative initiative for their series Girl In The City Chapter 2. The series is hugely popular with youngsters and it’s exciting to be a part of an initiative that encourages young entrepreneurs and celebrates their dreams, aspirations and success. I really look forward to meeting the girls and creating special designs for them,” said designer Nishka Lulla. Over the past few years, bindass has emerged as one of the significant youth brands in the country – pioneering concepts and initiatives that resonate with Young India. The brand captured the imagination of its audiences with two recent shows - Girl In The City and The Trip. The phenomenal response to these shows encouraged bindass to return with a new chapter of Girl In The City-Chapter 2 in March this year. Girl in the City, a story of self-discovery, is centered round Meera, a bold, creative and confident 21-year-old girl who moves to Mumbai to pursue an internship in fashion. In Chapter 2, she returns to Mumbai to take her fashion career forward. 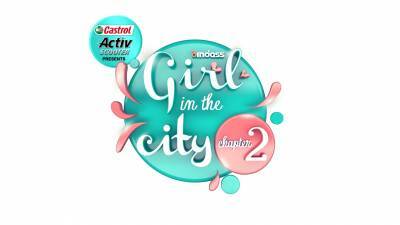 For Girl In The City Chapter 2, bindass associates with Castrol as the presenting sponsor, Flipkart Fashion as the style partner and Tanishq Mia as the jewellery partner. Currently running its sixth episode, the season has seen an overwhelming response and has reached out to around 17 Million fans. A new episode of Girl In The City Chapter 2 goes live at 6 pm every Friday on bindass Facebook page https://www.facebook.com/bindass, followed by a simulcast on Youtube https://www.youtube.com/bindass. The award winning bindass show 'HallaBol' is back with more inspiring stories!